Its KaKashi here and today I am doing a review on the new burn card AMP Field. First Of all I like the idea of the AMP card but I do not like the implementation of the card in the game as it does not appear to me to be a very effective card except for specific squad setups like main turret rush and depot squads with opportunities to properly utilize the card being limited. This may change in future balancing by reducing the energy cost and the area of effect to keep it balanced but allow for more reactive situations for it to be usable in combat. The buff effect is a 40% speed increase to time based mechanics in the game such as the attack speed, movement speed, depot production, hardpoint capture and scoring speeds to any friendly unit within its radius. .The level of the card only influences the duration of the buff effect with a level 11 card giving you a duration of 9.6 seconds. At a 20 radius the AOE is quite large and the effect is only active for as long as the units remain in the area it is deployed. The best situation to use the card is when attacking enemy turrets as it usually takes a longer to take down a turret which allows a unit to focus on a single stationary target that cannot leave the buff area and will not die to fast and waste the rest of the duration of the AOE buff. It is unlikely that I will build a base rush deck again that does not include this card. I prefer using medium supply cost titans in combination with this card so that I can deploy a titan at the correct location at the right time and then follow up immediately with the AMP field as it is very difficult to deploy a 7 cost Core titan or * 8 Cost BT-7274 and then wait to build up energy to deploy the AMP field which gives the enemy enough time to respond and deal with the titan before you were able to cast the AMP field. The cheaper titans also work better for me as it is more effective to have 2 times 4 or 5 cost titans buffed instead of 1 expensive titan that is buffed that can get focussed on by the enemy. The titans that AMP field synergises the best with for me is by far the fast attack speed titans such as Ronin, Smoke Strider and Ion titans as they have relatively high attack speeds which increases dramatically and it looks really good when Ions AOE attack turns into a semi-automatic machine shotgun and Ronin goes into berzerking Samurai mode. These units all have fast movement speed and when they enter the buff area their movement speed is increased dramatically and this works great to close the gap between the deployment area of titans and the turret they are targeting causing titans like the Ronin to sprint really fast and get into melee range. Focus on not misfiring with the ability as you waste 4 energy when you miss any friendly units or enemies leave the effects area. Timing is crucial for this card as you can cause a doomed titan such as a Ronin, smoke strider or ion to clear up quite a few enemies within its doomed 10 seconds if the enemy is not focus firing on your doomed titan but on the other hand you can cast it on a full health titan which is being focus fired and die really fast causing a big waste in energy spent on the buff. To me this is a high risk high reward card to play that can fail miserably unless you are using it to take down a turret which has a better chance of giving you a big reward on energy spent. The buff seems to synergise well with cards that deploy fast with a short cooldown after deployment such as drones as drones and AMP field I found is one of the most reliable and effective combinations. It would have been the case with the grunt squad as well if their damage was not so low. The pilots this card seems to work well with is fast attack speed pilots such as the gunner, pyro bruiser and Jack cooper but not slow attack speed pilots such as boomers or grenadiers. If you have a battle between some titans and your titans are tanking the damage and you have a gunner entering the combat area it is a perfect situation to cast the AMP field as the gunner ramps up his attack speed really fast and melt any high health unit. I would definitely prioritize casting the AMP field on titans rather than pilots in most cases. Logically and mathematically you would assume that slow attack units such as boomers, grenadiers and core titans will receive the biggest benefit from a 40% attack speed buff but don’t be fooled as 40% increase is a relative attack speed increase and I have tried this card on slow attack decks and failed every time having a lot more success with fast attack speed decks. It appears that the pyro bruisers AOE damage death effect is also effected by the speed boost which is very effective at defending a hardpoint as well as the smoke stryders rally point effects damage ticks. Even though it increases the production rate of depots I do not like using this cards on depots as the spawned units are low health which does not deal high damage and it’s too much of a buff investment on disposable units where I would rather try to squeeze as much potential out of a high supply cost unit that can deal damage itself with this buff. It seems to be quite effective on supply depots especially if you have at least 2 supply depots in production to really have a worthwhile investment. I prefer playing supply depot without the AMP field as a single supply depot plus a AMP field amounts to a supply cost of 9 supply in which case I could have deployed an additional supply depot instead giving me a better supply flow allowing me to overrun the enemy but I have had some success playing supply depot and AMP field together. I do not suggest using the amp field to increase the speed of hardpoint capture or point accumulation as it could give you more value used in combat situations. *Not effective on slow units such as core titans. 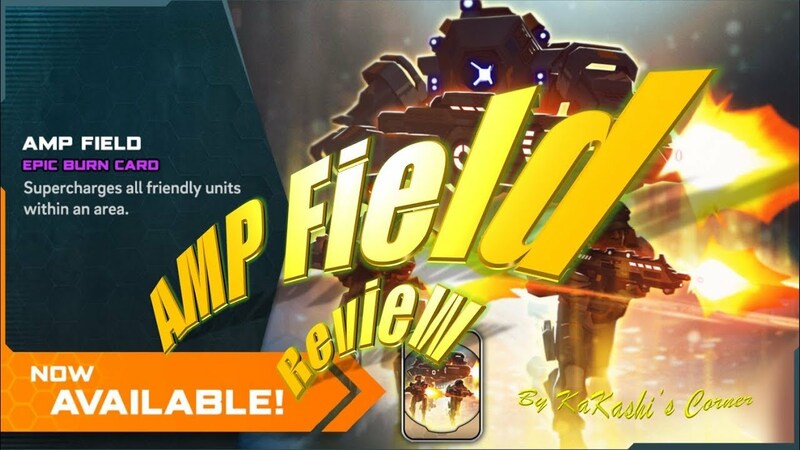 Please let me know if the comment section below what you think of the AMP field and please subscribe for more videos like this in the future and let me know which cards you would like me to review. As always – have FUN.